Autopilot just got better with the new Tesla Summon feature that allows owners to park their cars from outside of the vehicle. This feature came as a surprise to many owners across the world when they woke up to the latest Firmware 7.1 which, along with the ability to self-park, also introduced improved Autopilot safety features, auto-open/close of your garage through HomeLink, and real-time Supercharger availability. Below is a series of video highlights from Electric Jen that shows how Tesla Summon is able to navigate the Model S through tight spaces and narrow garages. Check back as we provide a more in-depth look at each of the latest Firmware 7.1 features. To engage the Tesla Summon feature, press down the middle button on the Tesla fob until the headlights begin flashing. The vehicle will turn on and self drive up to a maximum of 39ft. before stopping. At that point it will also activate the new HomeLink feature which will automatically open or close the garage depending on your direction of travel. 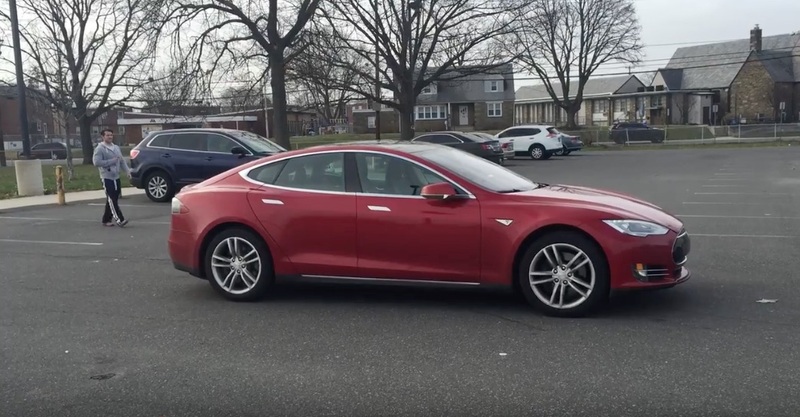 As we Electric Jen practices forward parking with the Model S with Firmware 7.1’s Tesla Summon, the car is purposely placed on a diagonal to parking lines. The Model S is seen auto-steering as it attempts to navigate itself into the parking space. Check back with us here at Teslarati for firmware feature demonstrations. News also available on demand through our iOS and Android app.